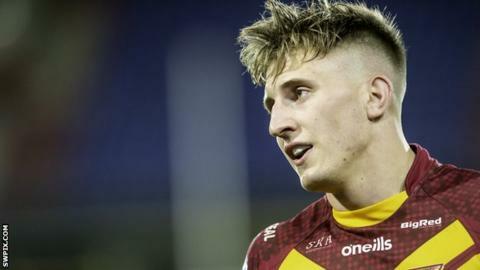 Alex Mellor scored a hat-trick of tries as Huddersfield Giants held on to beat Castleford Tigers in a thrilling game at the John Smith's Stadium. Castleford took an early lead when Greg Eden ran in unopposed from the halfway line following an interception. Mellor scored for the Giants either side of the break but Matt Cook powered over to re-establish Cas' lead. The hat-trick was completed when Mellor crossed late into the game as the hosts held on to seal a narrow victory. The result means Huddersfield pull four points clear of bottom side Leeds Rhinos while Castleford miss the chance to put the pressure on leaders Warrington and second-placed St Helens. In an entertaining first half, both sides saw their chances of extending their lead thwarted by the video referee just before the break. Firstly, Mike McMeeken looked to have touched down for Castleford but replays showed he dropped the ball inches from crossing over the line. Moments later at the other end, Jermaine McGillvary dived over at the corner but it was judged not to be a try on further reflection. In a thrilling end to the match, Huddersfield's Darnell McIntosh missed the extras following Mellor's third try but the hosts held on as Cas finished with 12 men after Adam Milner was sent to the bin. Huddersfield: McIntosh, McGillvary, Turner, Uate, Gaskell, Frawley, Leeming, Matagi, Murphy, Mellor, Ta'ai, Jake Wardle, Joe Wardle. Interchanges: O'Brien, Roberts, Ikahihifo, Hewitt. Castleford: Mata'utia, Clare, Minikin, Shenton, Eden, Trueman, Watts, Millington, McMeeken, Milner, Sene-Lefao, Moors, Turner. Interchanges: Cook, Clark, O'Neill, Smith.